Happy New Year! And, it’s the first Stretch Tuesday of 2017! BugDoc Dave here after spending an “awful time” in Florida over the holidays where it has been a steady 80 to 85-degrees every day except for one! But, enough of the hot weather! 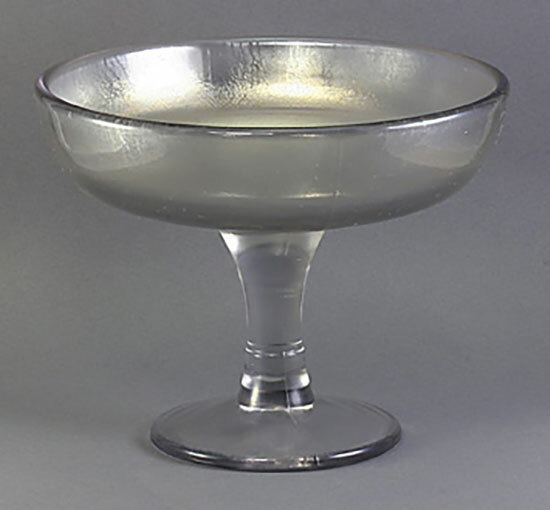 I’m going to continue with some of the minor stretch glass manufacturers today – this time I’ll discuss some of the Jeannette production. 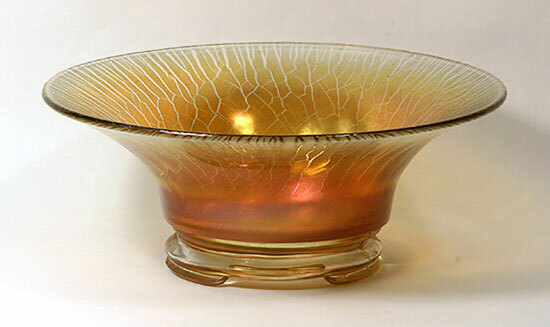 Jeannette is one of those companies where we have little information on their operation and their iridescent lines other than what can be gleaned from advertising pieces of the 1920s. 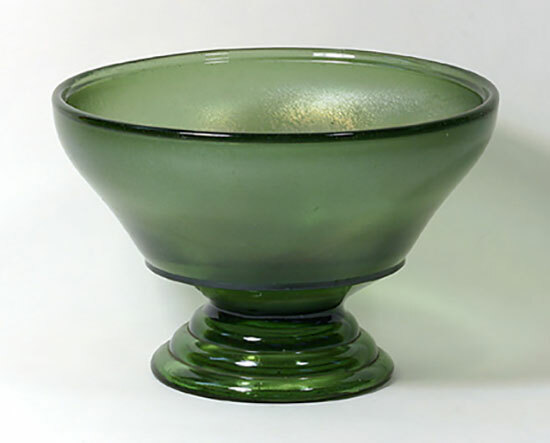 They made two “normal” bowls with snap bases, two three-footed bowls, and a high-footed bowl that has a three-ringed base. Most of their production was marigold stretch, but they really made some eye-popping, multicolored pieces! In fact, much of their marigold is so good, most dealers assume that the pieces were made by Imperial! 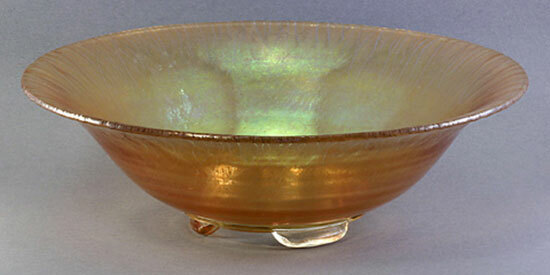 One of the most common bowls has a 4 3/4-inch base and the top is usually flared out to the 11-12 inch range. 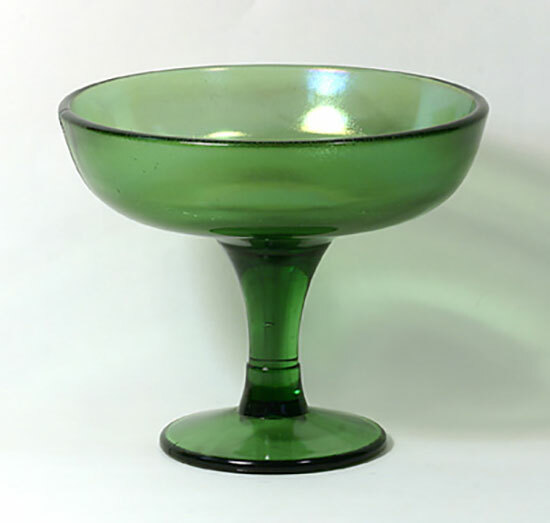 A few of these pieces may have a rolled rim and I know of one with a square rim (four sides up). 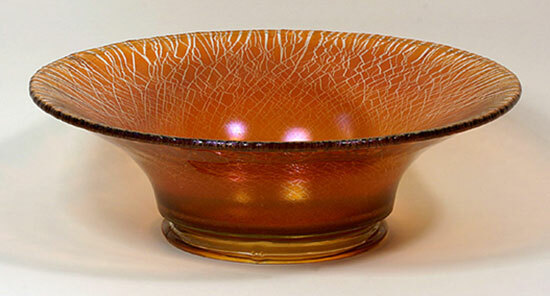 The other snap-base bowl has a 4 5/8-inch base, has a more straight sided lower part of the bowl and is always flared out to the 9.5-10 inch range. They also made two bowls that have three feet molded into the snap base. The larger one has a 4 5/8-inch base and is often flared out to 9-10 inches. The other one has what appear to be three small spade-style feet which are about 2 7/8-inch in diameter and the top is usually flared out to 9-10 inches. Unfortunately, the spade-footed bowls can be difficult to find with perfect feet. 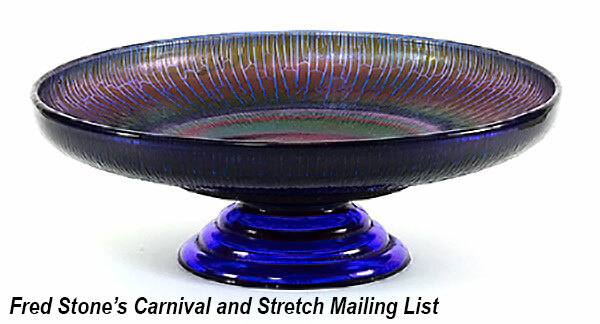 Jeannette did make some great colored stretch glass, but the colors seem to be limited to the high-footed bowl (though many would call it a comport). 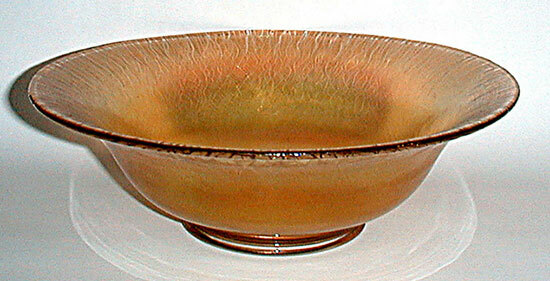 This piece is most commonly found in crystal stretch. 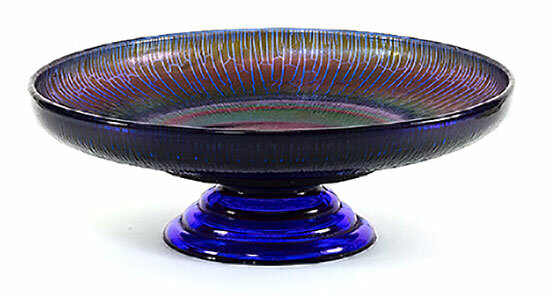 However, much rarer pieces are known in a light cobalt blue, a dark cobalt blue, purple and a strange olive-green color. The top is usually flared out at a 45-degree angle or crimped. I know of only one piece with the top cupped in and there are a couple of pieces that are flared out and cupped up. 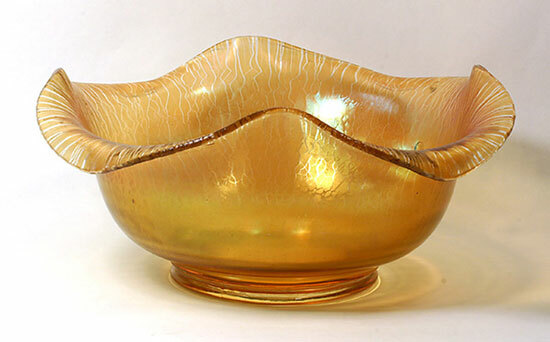 You have all seen this piece with a tree bark exterior in shiny marigold! Only one piece (a dark cobalt one!) has shown up with stretch iridescence and the tree bark exterior. Jeannette did make a true comport and it’s usually not overly spectacular! It normally comes in crystal stretch, but a couple of the olive-green ones are known. Some years ago, one of our members showed up with a strange blue-purple one that we soon realized had been given a radiation treatment – I hate it when some dealers do that! 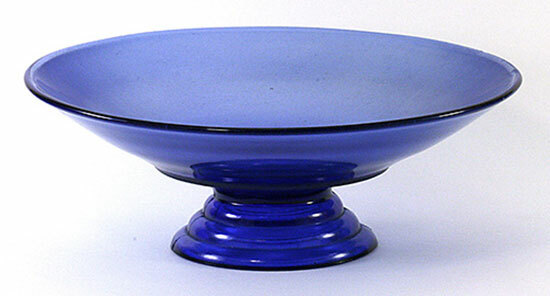 This little comport has a 3 1/2-inch base, the top is about 6 1/2-inches across, and it is about 5-inches tall. Just a reminder – Jeannette also made two handled servers which I covered earlier. Both have shovel handles with one handle being narrower than the other. Again, these are only found in shades of marigold.